My neighbor Kathy gave me this recipe she found in Real Simple magazine. 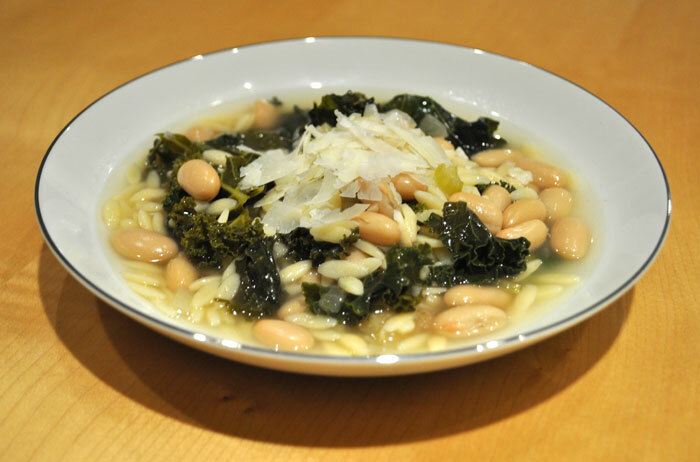 If you like rosemary, you will love this soup. It was even better the second day. Serve with a piece of warm crusty bread. Add the garlic, celery, onion, 1 ½ teaspoons salt, and ½ teaspoon pepper and cook, stirring occasionally, until tender, 4 to 6 minutes. Add the beans, pasta, kale, rosemary, 8 cups water, and Parmesan rind (if using). Cover and bring to a boil. Reduce heat and simmer until the pasta and kale are tender, 4 to 5 minutes. Remove the Parmesan rind. Stir in the lemon juice and sprinkle with the shaved Parmesan before serving. Serve with the bread.